There are few chefs I truly trust*—Jennie Cooks is one of them. 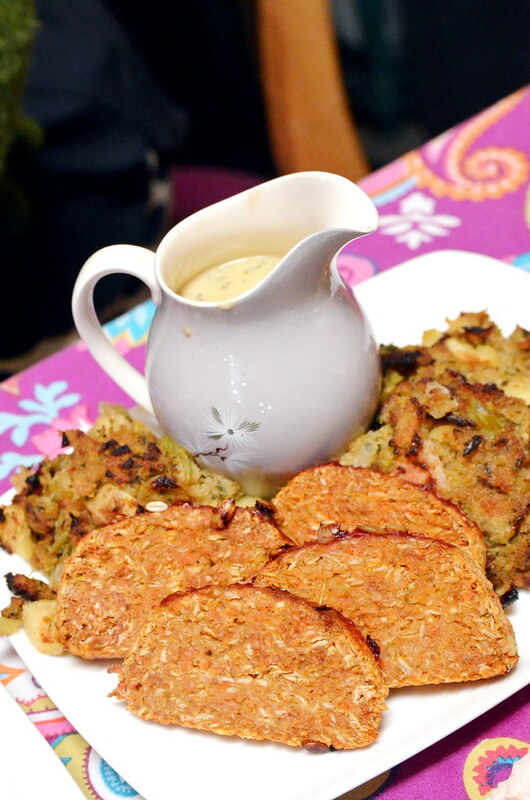 Beneath an angled mirror at Surfas, Jennie—my hometown culinary champion—poured a generous amount of olive oil into a pan and whipped up Sweet Potato Pistachio Fritters with Saba and Jaffna Potatoes. I sat there waiting for the non-vegan ingredient to get dumped in—a pat of butter, a drizzle of yogurt —but it never happened. 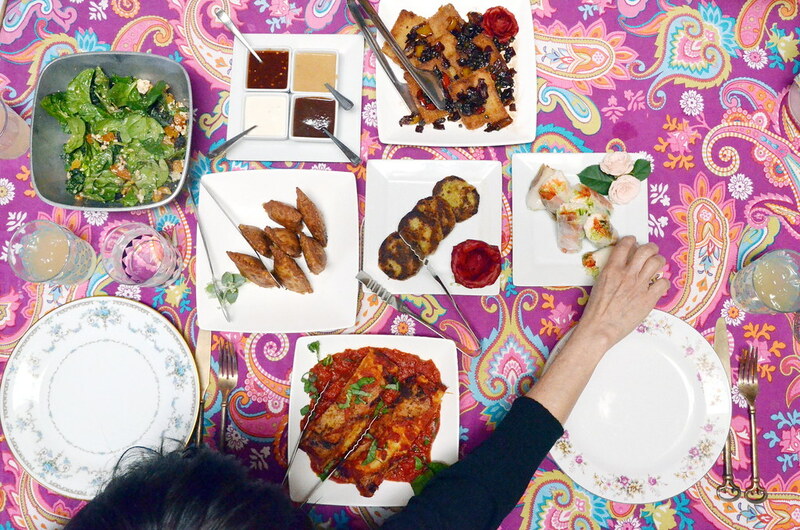 As the Endive Avocado Potato Salad and Cape Verda Vegetable were passed around, I realized every dish she made was vegan—and that never happens on accident. At that moment I knew I wanted her to cater an event for me. That event turned out to be my wedding reception. In her Atwater Village kitchen vintage pitchers, cookbooks, and salt and pepper creatures stare down at us. Jennie dances in and out of the kitchen, filling the tables with food. Some dishes are by request, some are by surprise. 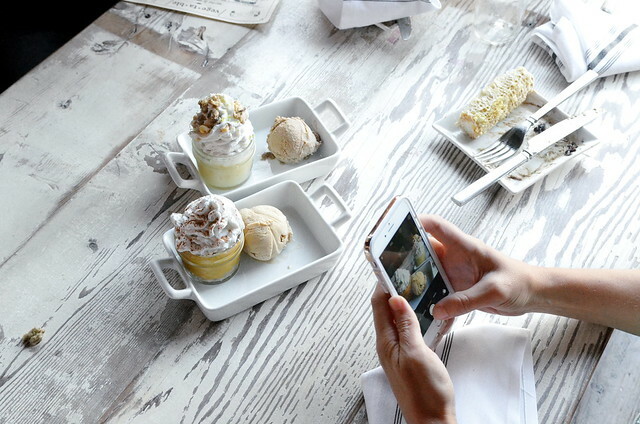 Wedding meal planning—as I learned—is a strange balance of personal taste tempered with the attempt to please the sometimes irrational and sometimes dietary needs of guests. First up, a fritter—the overlooked champions of cocktail hour. Jennie’s Sweet Potato Fritters with Pistachios and Crema are flecked with meaty bits of pistachios and pan kissed to a crisp. 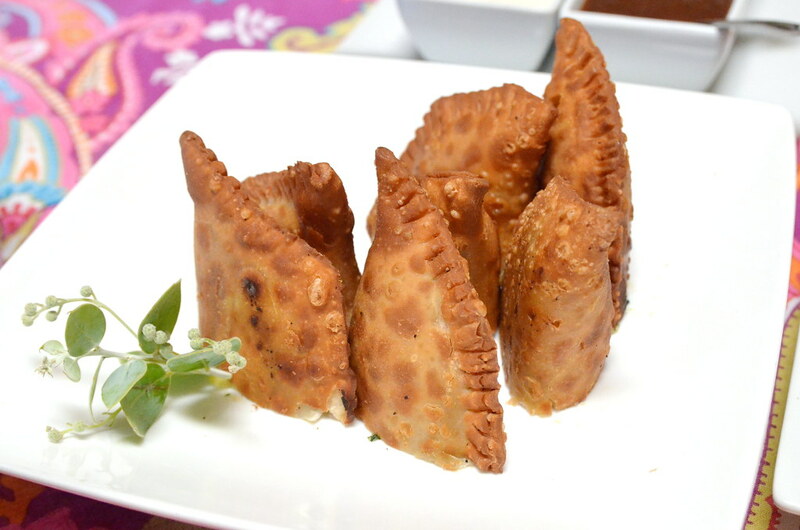 Spinning the globe, we toasted with Sweet Potato Samosas dripping with raven dark tamarind glaze. I loved them both, but sometimes the needs of others trumps love. 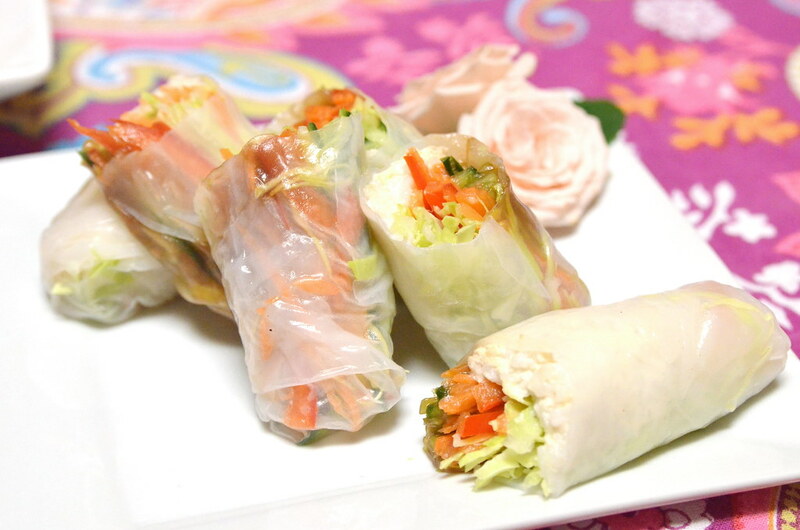 Translucent rice paper swaddling bean thread, red pepper, carrot, and cucumber as Fresh Rolls with Peanut Sauce (gluten free) were selected as our tray pass appetizer. Not shown here are the Chicken and Waffles because there as no questions those would be served. One of Jennie’s surprises turned out to be my favorite: Korean Dave’s Amazing Tempe with Campania. 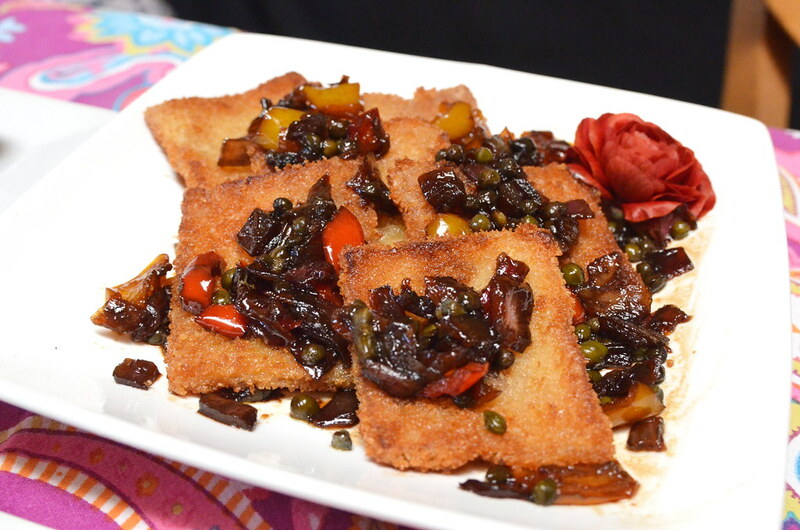 Caramelized onions, red peppers, and capers pucker with balsamic vinegar over panko crusted tempe—a distinctly Los Angeles ingredient. This chewy cutlet of fermented brown rice and black bean that is a local cult classic. 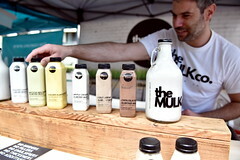 Dave has no online or marketing presence yet almost everyone knows his Framer’s Market food. After sampling Jennie’s prep of this protein, there was no question my guests needed to taste it as well. 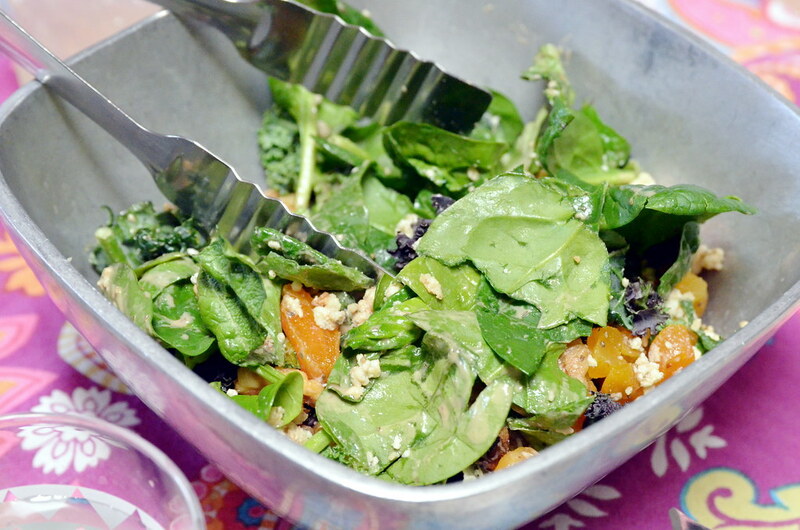 To balance the fried dish, we followed with the Spinach Salad with Crumbled Fettata, Apricots and Toasted Walnuts. While I had expected fresh apricots I realized such ideas were ridiculous for a March event. 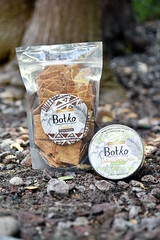 The soft fettata—seasoned tofu—clings to the leaves which we switched out for romaine to accommodate oxalate sensitive attendees. Roasted Vegetables seemed boring option—one I’ve consumed ad nauseam in my vegetarian then vegan life. 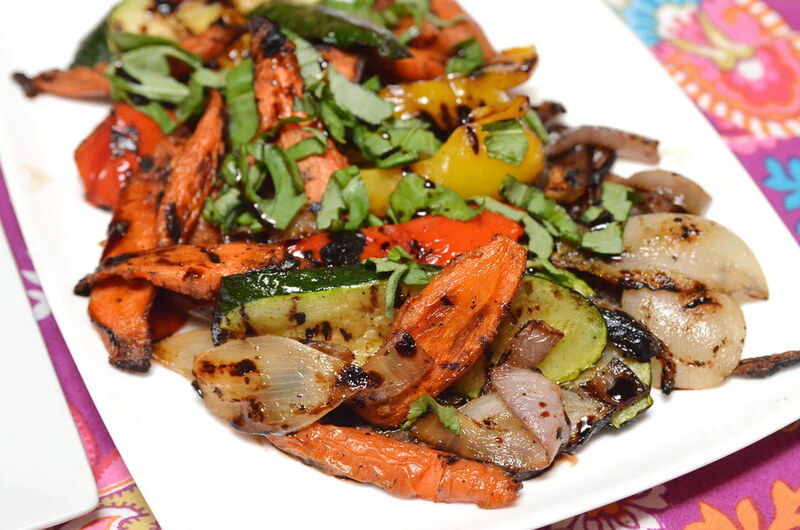 I had every intention of nixing this side until suckling on sweetly charred yet still juice carrots, onions, peppers, and zucchini caramelized kissed with balsamic vinegar. Through the experience of wedding planning I learned that I basically love Thanksgiving food. I fell quickly for legumes melting into the Red Lentil and Apple Load of Love—the flavors blooming in a pool of thyme spiked creamy dijon gravy. Paired with rolling hills of Sourdough Stuffing cradling crescents of celery, carrot, and tart cubes of granny smith apples. Just to prove that I’m not simply gushing, the soft mash layered inside the Sweet Potato Lasagna became too monolithic for my taste. But when these dishes made their way home as leftovers, my soon to be husband loved the lasagna more than the loaf. So we ordered a half pan of each because compromise and making each other happy is what marriage is all about. 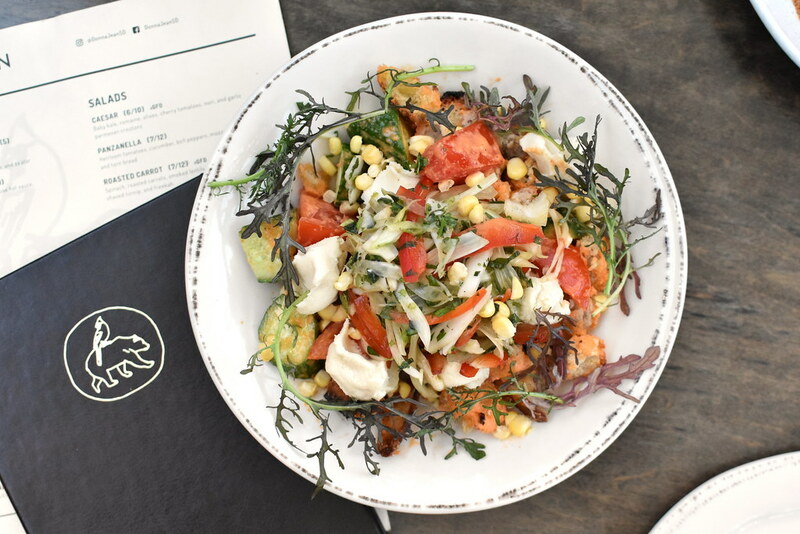 Donna Jean offers a vegetable forward menu with midwestern charm and California sensibilities. Under the dappling of the summer sun, pink radish bulbs push through the dirt under the kale leaves and carrot tops surrounding Donna Jean’s patio. Between the magenta shocks of bougainvilleas, tables fill with dukkah-dusted turnips and pizzas dotted with smoked dates and pickled shallots. Vegetables drive the menu—but all dishes are quietly supported by the spice and experience. A midwestern boy at heart, Chef Roy Elam carries the lessons learned there—use everything, force nothing. 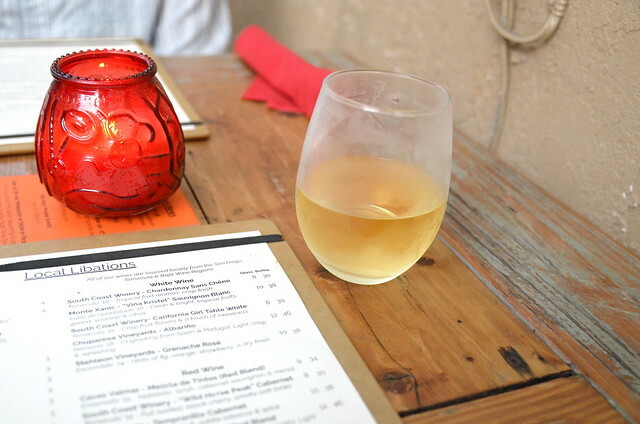 This hip space, which undulates between indoor and out, is known for creative cocktails, but they also have some seriously great vegan options. The soft blue paint of the simple façade blends into the clear skies above. Window frames popped up like visors offer glimpses of the wood-rich interior. Cedar planked walls are accented by geometric pops of blue, mustard yellow, and soft pink and modern fixtures resemble drops of white glass clenched in brass. Unseen from the street is the modern basilica of a dining room—a breezy semi-outdoor space enveloped by a 20-foot high arch. 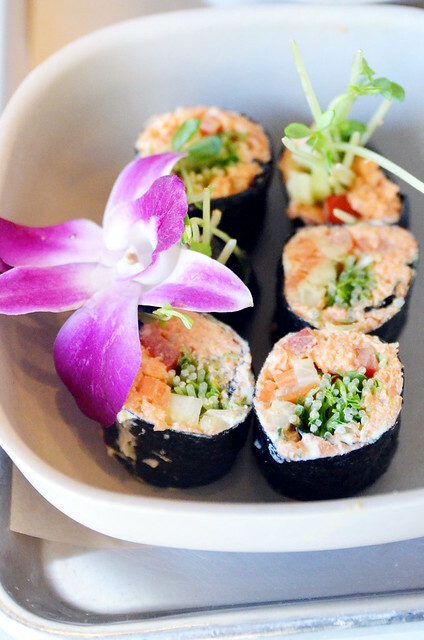 On the edge of residential Rolando, far from the sparkle of coastal locations, chef Coral Strong’s Garden Kitchen pulls from San Diego’s soil and presents the treasures in their naked glory and preserved peaks. 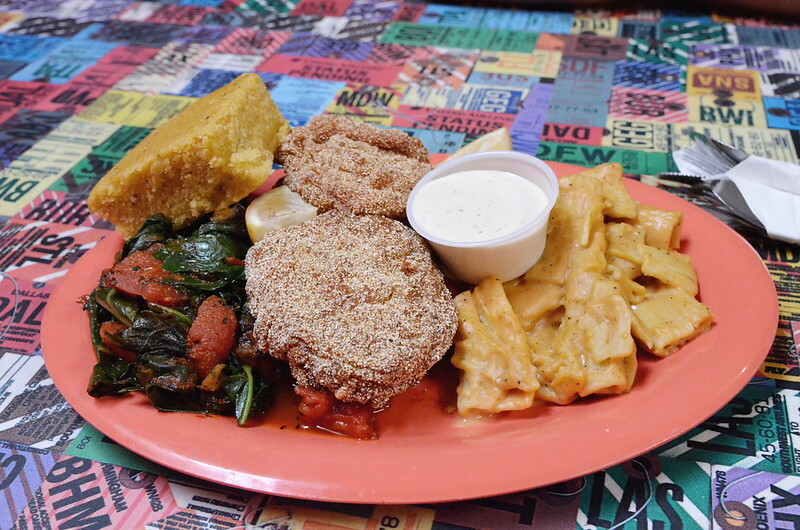 No dish captures this as well as the Kitchen Sink ($16). On menu it is a meat and cheese plate—but I rolled the dice on Coral’s veganization and won a bonanza. 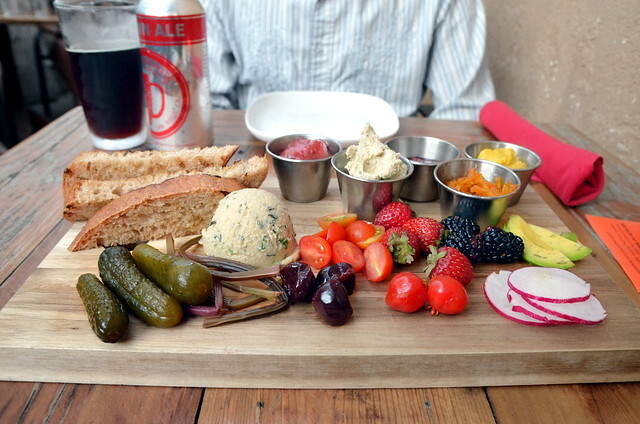 The dairy cheeses were replaced with luscious sunflower seed pate and a lemon and chive spiked cashew cheese. Served alongside spicy picked beet stem (a scrumptious no-waste solution), strawberries, blackberries, cherry tomatoes, avocado, gherkins, radish, pickled cherries, curry hummus, strawberry sage jam, strawberry rhubarb compote, smokey grilled bread, and glossy Surinam cherries from La Vigne Organics in Fallbrook (distributed via @wesavegoodfood). But the pot that I wished to drown in was the sweet and earthy fennel carrot marmalade. Assuming all vegan variations of this dish provide this level of quality and innovative, I’d say this is THE must order item in this restaurant. The beverage menu is short and well curated. 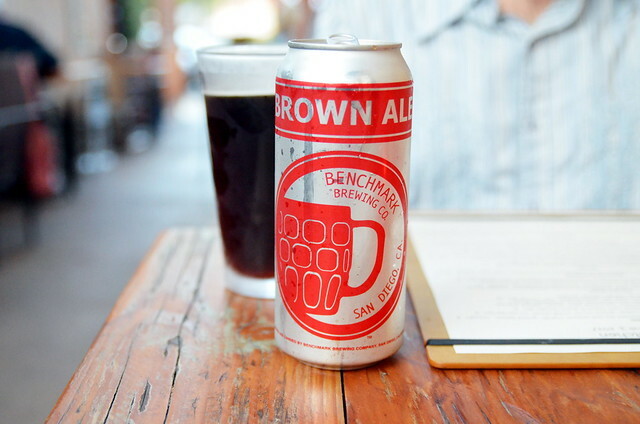 We diversified the table with a Benchmark Brewing Brown Ale and a glass of Chuparosa Vineyards (Ramona) 2016 Albarino ($12). I took a shot of the South Coast Winery (Temecula) California Girl Table White midway through the evening, but I stuck with the Albarino for the meal. Sometime when a item is marked “vegan option” you look at the subtracts need and wonder if it will still be good. Such was the case when I eyed the Greek Artichokes ($10). Described as “baby artichokes with arugula, feta, roasted red bell pepper, tzatziki, and grilled lemon” I took the risk and ordered it. The result exceeded expectation. Feta was replaced with an invisible to the eye, but not to the tongue, sage oil and the tzatziki gave way to a rich thai coconut curry. I filled the crevasses with drippings of charred citrus and devoured the entire flower, including its carefully dissected heart. Waves made still in the mire of Cream of Butternut Squash ($8). 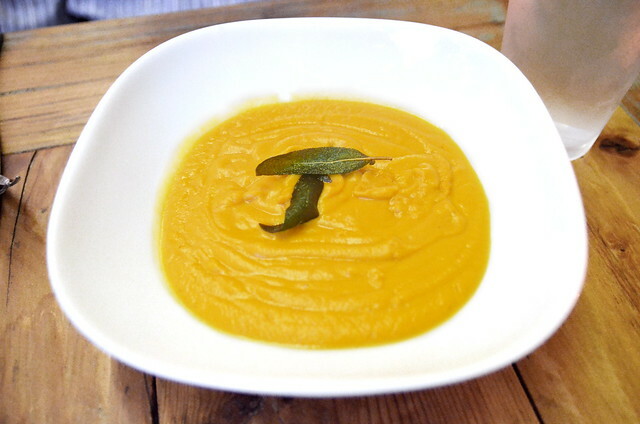 Pureed squash with a modest amount of house-made vegetable broth and topped with crisp sage leaves. Berry Goat ($14) arugula, strawberries, blackberries, roasted fennel, candied pecans, shaved radish, and red onion in a strawberry champagne vinaigrette. 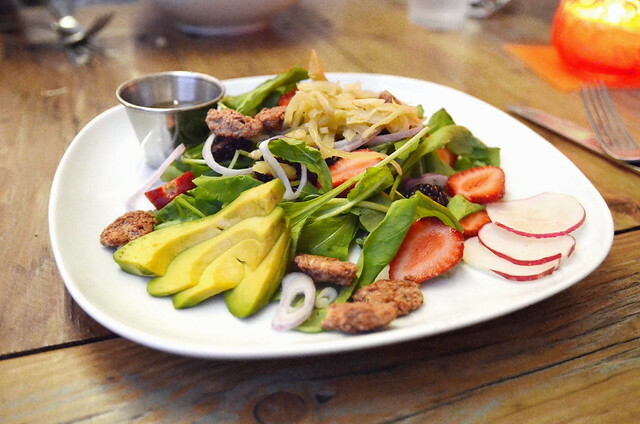 In lieu of goat cheese, chef Strong offers up avocado and radishes. Roughage was needs for this meal, but the avocado didn’t temper the tart of the berries they way a cheese would. But having just indulged ourselves in the Kitchen Sink, I understand the chef’s attempt to not repeat herself with a cashew cheese. Tacos–especially those filled with mushrooms–are never my first pick. But that was the vegan option my night at Garden Kitchen. 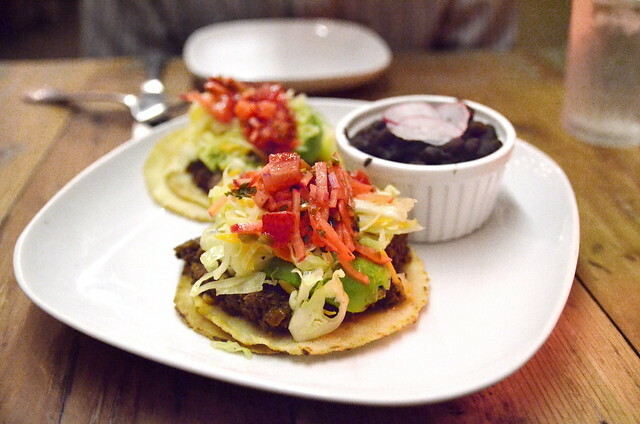 Double stacked, scratch-made, corn tortillas could not contain the heaping base of finely ground cremini “Chorizo,” nugs of hass avocado, cabbage, carrot and fennel slaw finished off with a strawberry pico de gallo ($20). As I’ve always complained about tacos, a fork was necessary to transport these into my mouth. But while I may lament form, I am thrilled to encounter fruit in unexpected places. Here, strawberries got to expose their savory side–tart and crunch twinkled in the forefront as sweetness slid behind the scenes. The pot of black beans were rich with seasonings of the southern islands and I feel eminently guilty for having not scraped that ramekin completely clean. 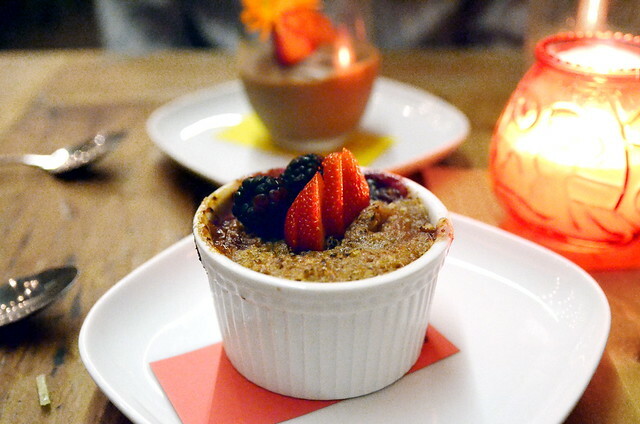 With one vegan dessert option listed, Chocolate Mousse ($9), the waitress let us know the kitchen could also make us a Peach & Blueberry Crisp ($9). Stuffed silly and unable to reach a conclusion, we let the kitchen choose: The kitchen chose both. The base of summer fruit, tart with lemon zest, lies hidden under a crisp on top and oatmeal gooey below cinnamon and steel cut streusel. 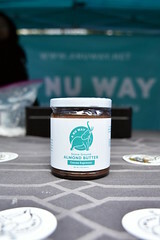 Mildly sweet, as fruits should be, it was no match for the luscious glass of chocolate-whipped avocado and coconut cream, grounded by base notes of mocha powder and tart cymbals of strawberries. 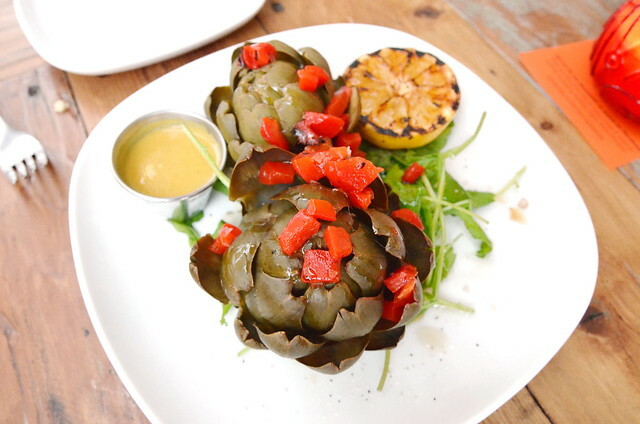 Beyond the thoughtful vegan options, Garden Kitchen stands as my ideal restaurant. A space build without pretension–a renovated home patio made cozy with awnings and heat lamps and the occasional wail of a babe living next door–Chef Coral’s presence screams sincerity. She takes each table to heart, serving her talents without ego, and enabling her staff to funnel the kitchens graces through attentive service and culinary accommodation. It kills me to think there are people missing out of this restaurant simply because of its location. 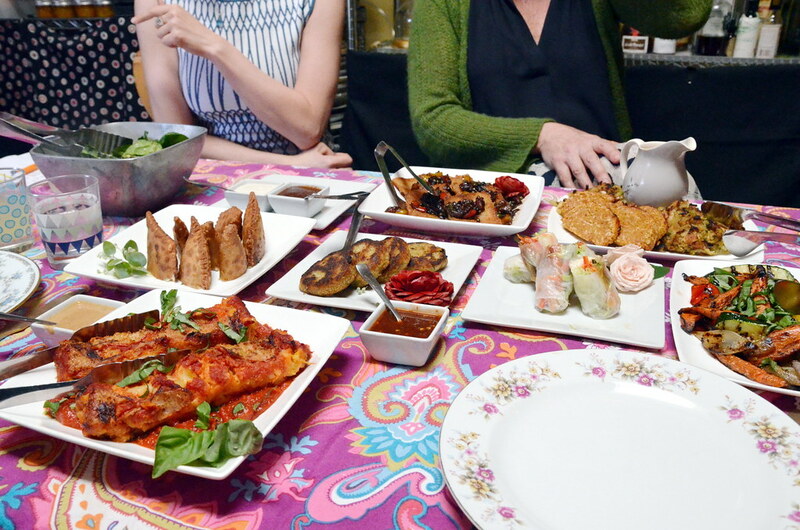 But on a random week night the house seems full enough to keep a smile on chef Coral’s face and my table full of wine and surprise vegan dishes beyond what the menu promises. If I had the means, I’d eat here regularity. But till then, I’ll be directing as many as I can to come to Rolando for what is truly a taste of San Diego. 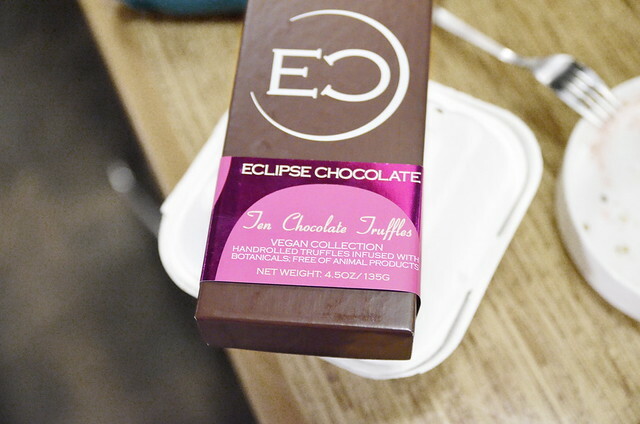 An invite to Eclipse Chocolate for dinner was bewildering. 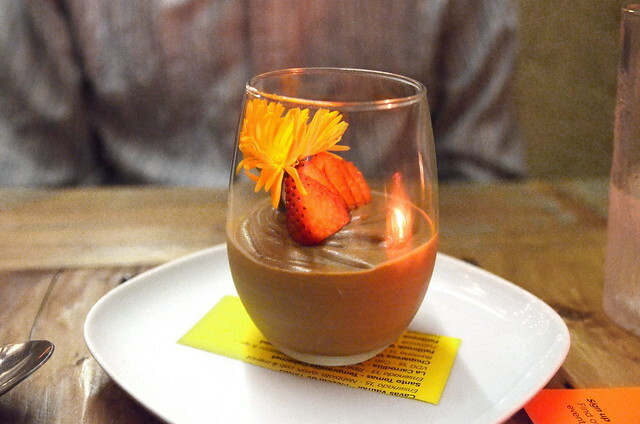 Only because I had no idea this chocolate shop—whose bars can be found at shops throughout San Diego—is a full service restaurant with vegan options. From start to finish the menu is sprinkled with hints of a pastry chef—a little coco here, a splash of vanilla there—all in a savory context. We kicked off the meal with cocktails. 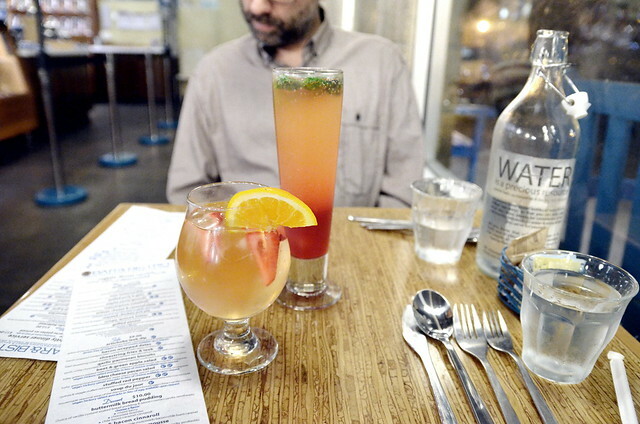 As sweet as should be expected in a spot that specializes in chocolate, the Muddled Blood Orange Basil with sparkling cava ($10) and Vanilla Bean Sangria ($8) were too syrupy for my taste. 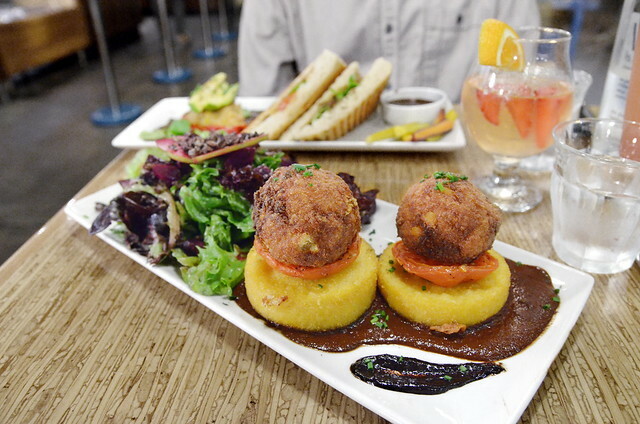 The Crispy Quinoa Fritter at comes precariously balanced on a roasted tomato and polenta cake crowned with little chives and served in a pool of cocoa mole with a swipe of black garlic puree. I loved this but could have used triple… nay, quadruple the amount of sauce which I’ve since been told they will provide if asked. I didn’t know to ask. Now you do. There is only one vegan dessert at Eclipse Chocolate but the waitress assured me it was not a compromise. She was correct! 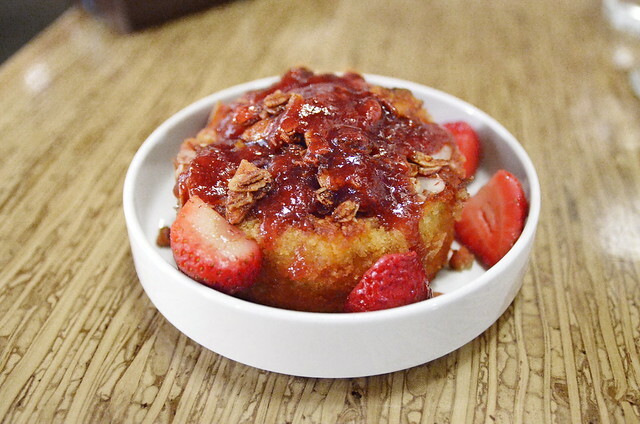 The Olive Oil Almond Torte, served warm, comes drizzled with a tart strawberry rhubarb compote, fresh strawberries, and vanilla salted pecan granola. Complex, rich, and not too sweet. We may have even ordered another to take home. Helming the Studio City kitchen, Jerry Yu delivers vegetarian—mostly vegan—dishes devoid of mock meats and omnivorous similes. 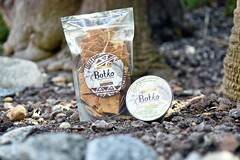 Yu relies of the breath of organic fruits and vegetable adorn with nuts whipped into luscious sauces. 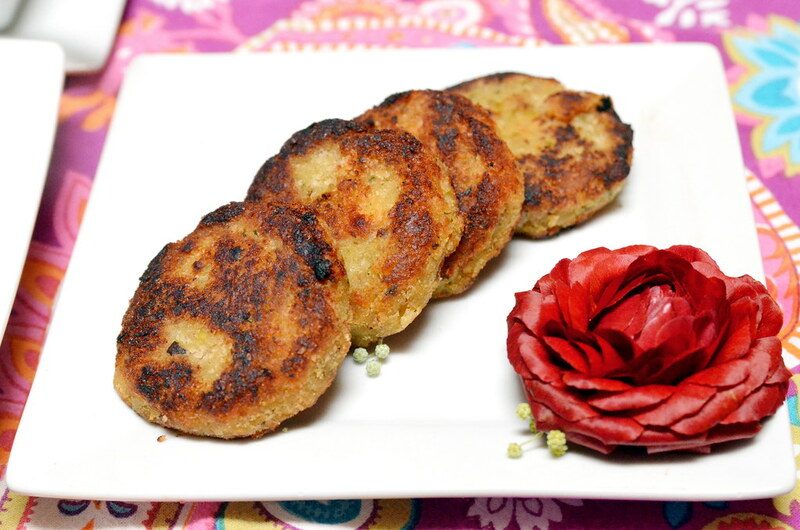 On paper the preparations sound simple, but they comes together like magic on a plate. 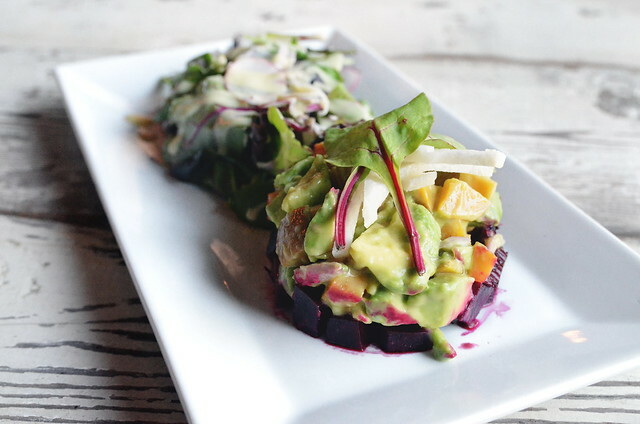 Roasted Red and Golden Beets with Reed avocado, baby greens, pickled jicama, and shaved radish in a lemon garlic dressing. The earthy beets take center-stage, supported by the buttery avocado and peppery greens. 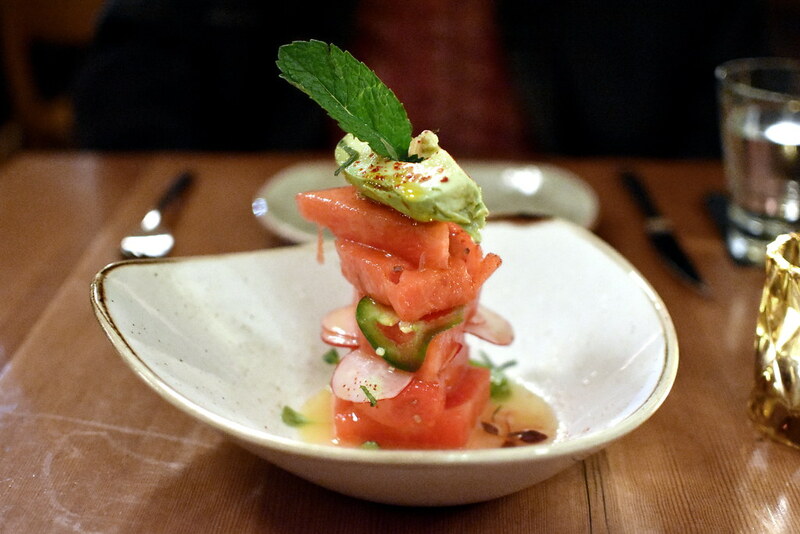 The dish makes only the lightest alteration to already perfect vegetable embracing the spirit of the restaurant’s name. 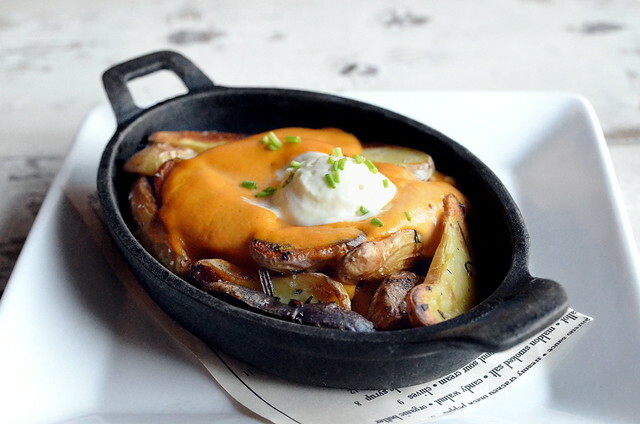 The Cheesy Fingerling Potato with nacho cashew cheese sauce, chives, and coconut sour cream. Buttery potatoes slathered in nutty cheese pull at the parabolic heartstrings connected to the notion of comfort food. 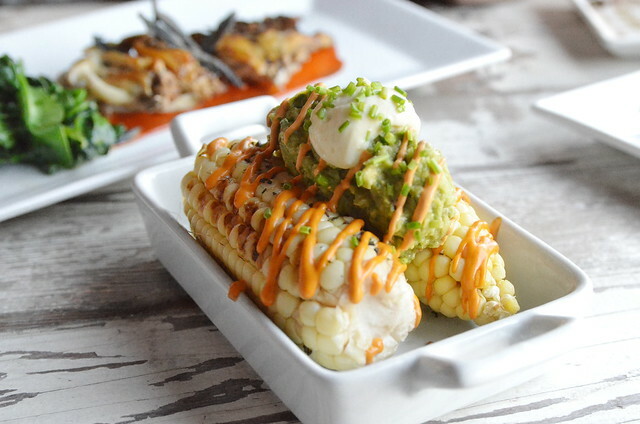 Grilled Corn on the Cob with guacamole, brown butter, Sriracha aioli, coconut sour cream and a light dusting of chives. This dish will enviably leave one with messy hands, but isn’t wiping aioli off your face and licking the brown butter dripping down your arms part of the joy of the summer corn harvest? 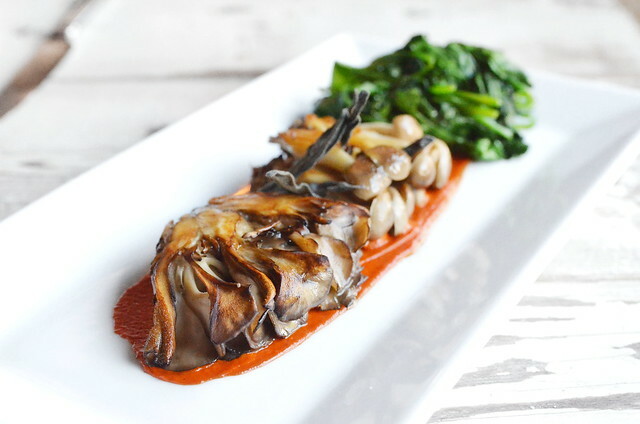 Duo of Seared Maitake and Beech Mushrooms over a red pepper creme with wilted spinach and crispy sage. Now, I strongly dislike mushrooms. I despise their very existence and squirms at the sight of every single variety, in every preparation, by everyone*. So as lovely as these are (and yes I did take a bite) this is not the dish for me. The spinach, on the other hand, was perfect and I happy gobbled that down while everyone else ate these seemingly delicious ‘shrooms. 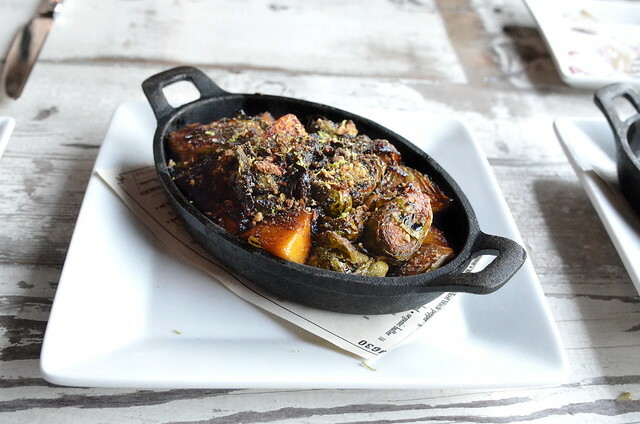 Teetering on the edge of being charred oblivion, the cast iron Roasted Brussel Sprouts at Vegetable continue to delight me. Their feathered fringe nearly black, these cruciferous vegetables retain a tender green core. Soaked in the juices of yellow peach and red onion, the sprouts burst in your mouth. The char is spiked with basaltic, crispy gluten free bread crumbs, and bright lime zest creating dynamic forkfuls with every pass of this dish. 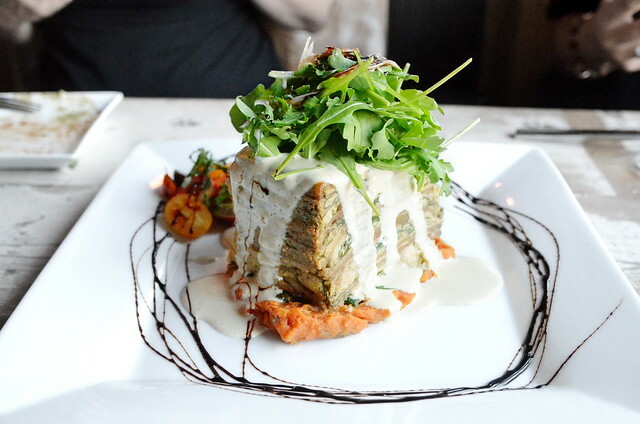 I was caution of the “healthy” brown of this artfully stacked Eggplant Lasagna. But the layers of thin eggplant, baby spinach and cashew ricotta made a plausible likeness to its pastaful namesake. Drizzled with a vegan alfredo, the stack balances on a mound of garlic sweet potato purée with pickled sweet onion and heirloom tomatoes strewn upon the balsamic painted platter. This unassuming bowl of Summer Fusilli Pesto was my surprise favorite. Ringlets of toothsome gluten-free pasta curl with cream and ultra fresh basil pesto and cashew ricotta. 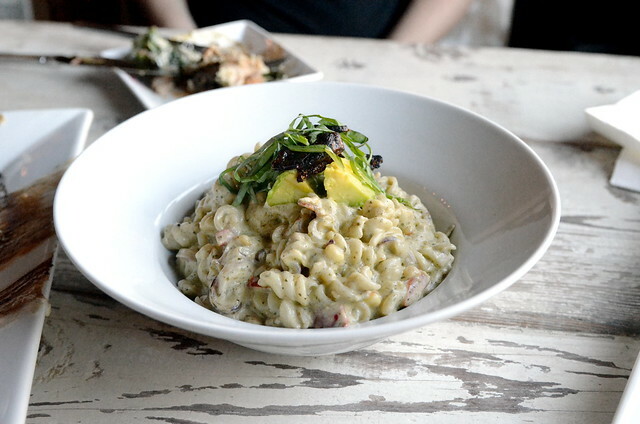 Tossed with sunshine sweet corn, tender sun dried tomatoes, and red peppers and topped with buttery Reed avocados and fig bacon this rich bowl of summer exemplify the “Guilt Free Comfort Food” ethos of Jerry Yu’s kitchen. Key Lime and Sweet Potato Pie mason jars with Peanut Butter and Fig and Rosemary Ice Cream. I LOVED the Rosemary accent! *There is one exception to this personal rule: @panchopalmera. He spikes his mushroom with some sort of magic and I’m completely under his spell. 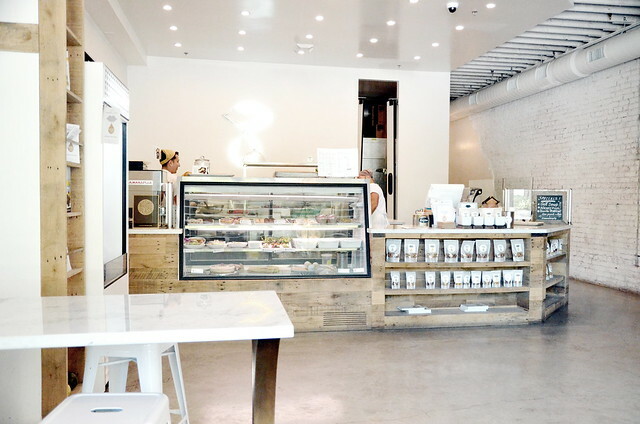 In the shadow of the Culver Hotel, the wellspring of Matthew Kenney’s Make Out quietly places vegan—mostly raw—foods in a glass front case for viewing. The shelves offer a colorful selection of huge rolls of green, tiny rolls of carrots, flatbreads, and bowls of kelp noodles. Further back, stainless steel holds two daily soups. 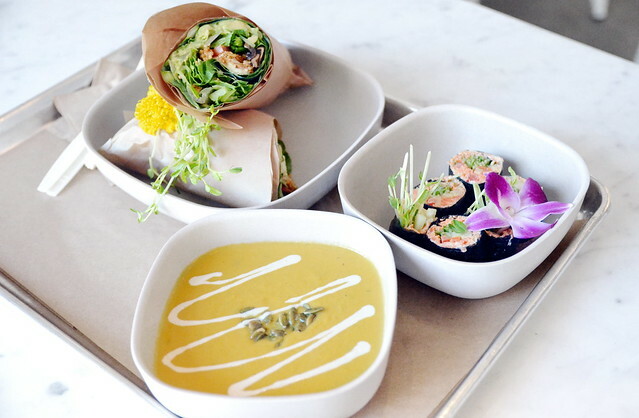 Samples of both were offered to us and the velvety Creamy Carrot Ginger Soup—drizzled with cashew creme and crunchy pepitas—leaped to the top of our order. 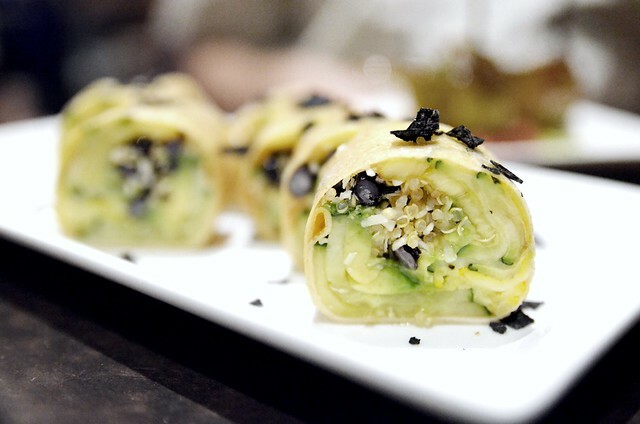 In heyday of NYC’s Pure Food and Wine, Kenney dazzled me with his dehydrated jicama pine nut sushi rice rolls. So I couldn’t pass up his new rendition, the Spicy Carrot Rolls, with jalapeno cream cheese and shredded carrots. 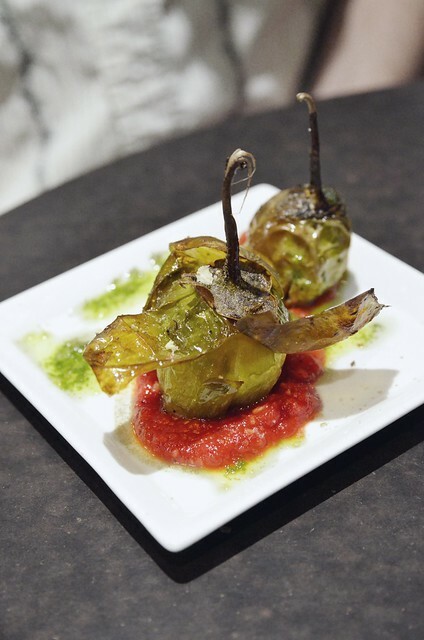 Stuffed with red bell pepper, cucumber, avocado, and young pea shoots these cool and crunchy bites almost lived up to expectation. 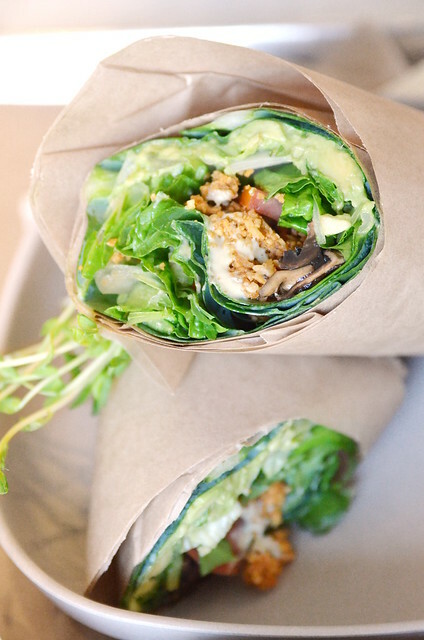 Wraps—especially collard green ones—are the crutch dish of vegan cafes. So I was least excited by the Cobb Collard Green Wrap. But my trepidation was unfounded, this wrap is exceptional. A massive collard husk filled with crisp romaine, sweet and smoky coconut bacon, meaty portobello, creamy avocado, and ranch. I would definitely order this sucker again. 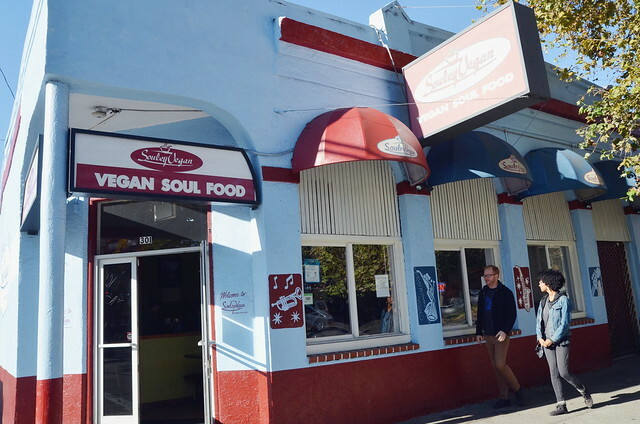 After finding success slinging organic smoothies from a train car in Flinn Springs (at the east end of El Cajon), Soy Leaf opened a second location on Magnolia Ave. 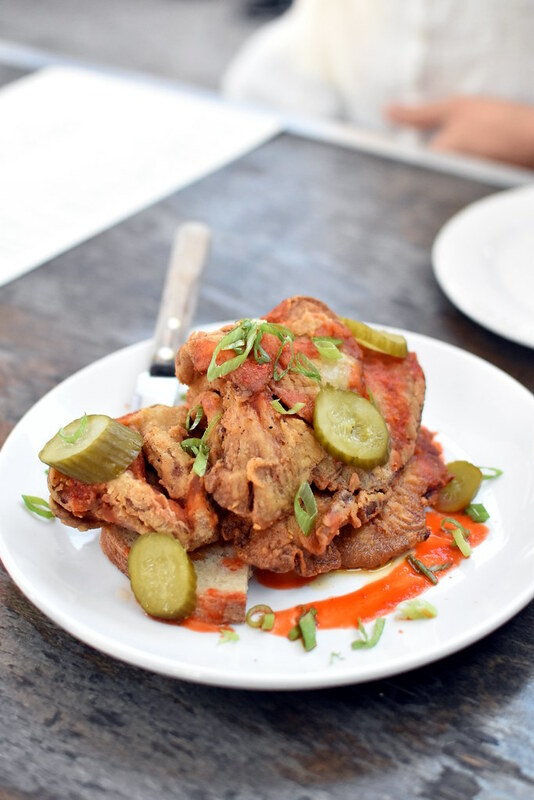 Filling the menu with pulled jackfruit and house made Italian seitan, Melanie Arce brings quality vegan food to east county. I jumped instantly to the ever popular BBQ Jackfruit Burger. 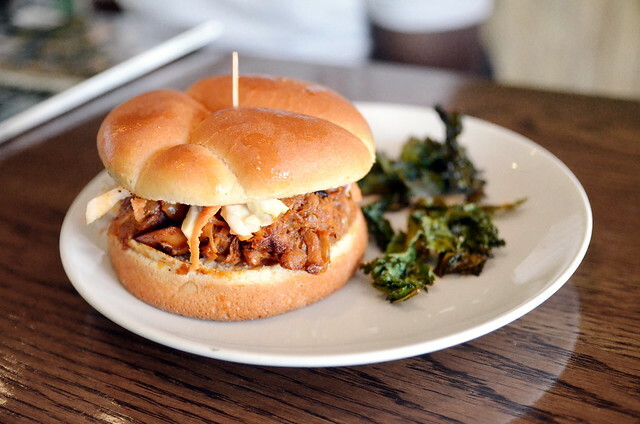 Tender chunks of saucy pulled jackfruit tempered with crunchy slaw on a soft wheat bun. While I would have preferred more heat less sweet, I totally get why this is the top selling item on the menu. Carly of VeganinSanDiego.com ordered the Hickory Black Bean Burger. 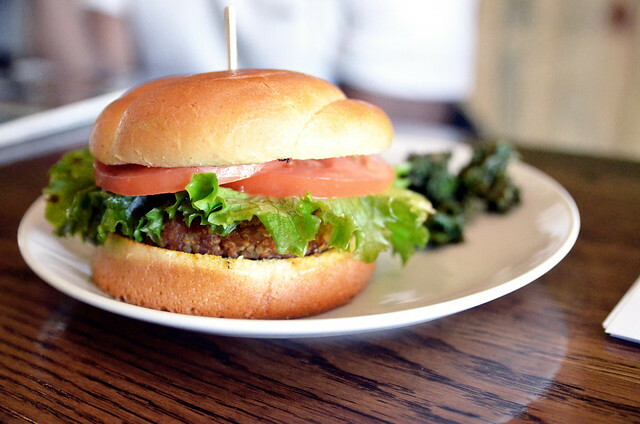 A house-made patty of quinoa and black beans glistening with a Dijon glaze and served on a bun with lettuce, tomato and mayo. She loved it! The burgers come will a small side of coconut oil and sea salt scented kale chips. 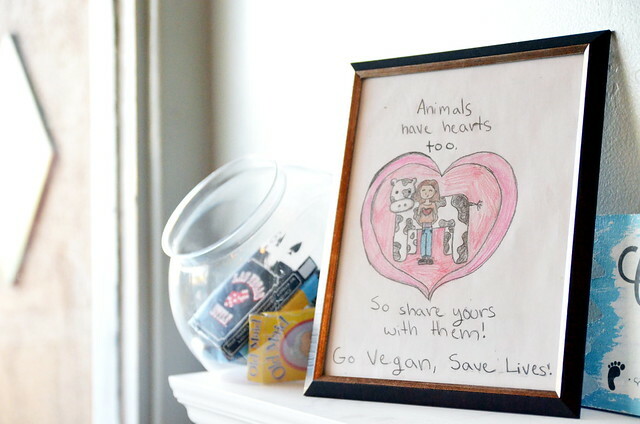 There is a small dining room (with art by some on Soy Leaf’s young fans) although there seemed to be ample take out service as well. As we sat there eating a few people wondered in, looked at the menu, then walked out. Flush with Gold Rush fortune, in 1857 Theophilide St. Germain built herself an opulent wine shop at 301 Broadway in downtown Oakland. Stalwartly as the city evolved around it, its perseverance makes it the oldest building in Oakland. Now, it’s outfitted by the equally indomitable Tamearra Dyson who quit her day job to follow her creole roots into the kitchen. It was a high risk move from which we all benefit. Colorful tiles adore the surfaces of the large, double dining room interior. A long dessert counter turns into a wine and beer bar—although anyone seeking a deeper selection of brews can head next door to outside-food-welcoming Beer Revolution. We started with the classic 3 Item Combo. A little pre-reading proved the Mac n’ Cheese and Southern Fried Tofu both strong recommends, so I ran with those. For the third, a vegetable seemed appropriate so I ordered the Collard/Mustard Greens. The ensemble is finished off with a sweet slice of cake-like cornbread. 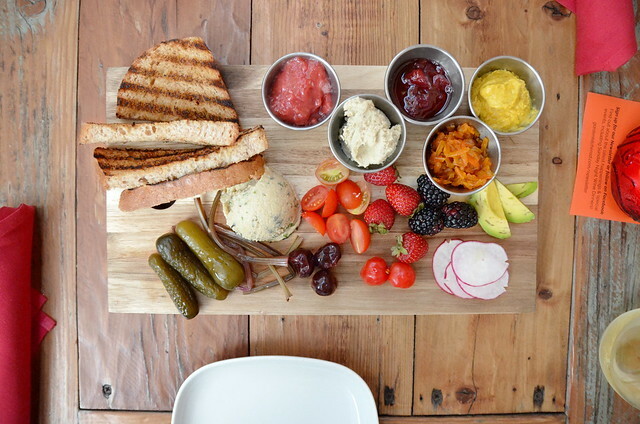 This platter is really more then one person should eat at a sitting; so bring a friend… or tupperware. Mac n’ Cheese: I was hesitated about ordering this. I’ve exhausted my tolerance for the endless stream of mediocre noochy noodles but the guy taking my order reiterated that is a must and so I caved. Being such a popular item, I imagine the kitchen has a huge 30 gallon vat of this stuff constantly simmering 24/7—or at least that is what it tastes like. 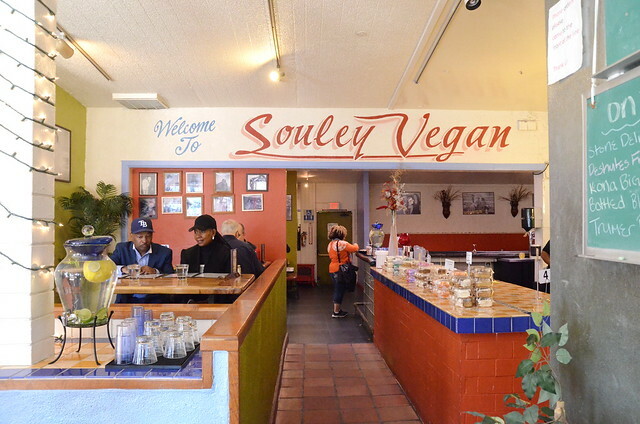 Southern Fried Tofu: This is another dish I’ve been constantly disappointed by (sorry Doomie’s and Southern Fried Vegan) but Souley’s pulls through. I loved this crisp cornmeal shell filled with a tender slab of tofu. 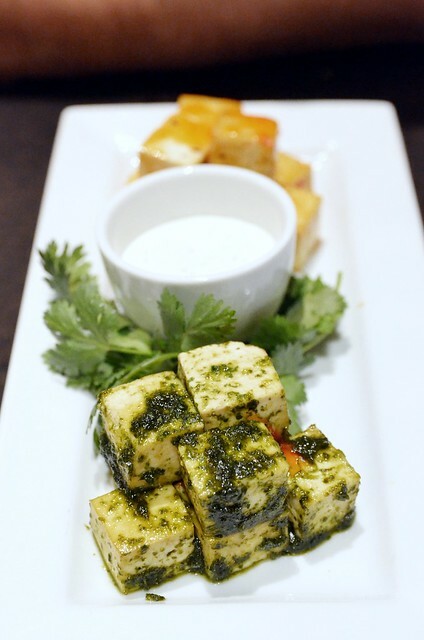 Served with a tangy tofu-based tartar sauce, this definitely lives up to expectation. Collard/Mustard Greens: This turned out to be the best item on the platter. Savoy greens stewed—but not over cooked—with a hint of sweetness from the tomato. We were fighting over the last bite! For dish two, the Seitan Chick ‘n’ Waffles sounded irresistible. 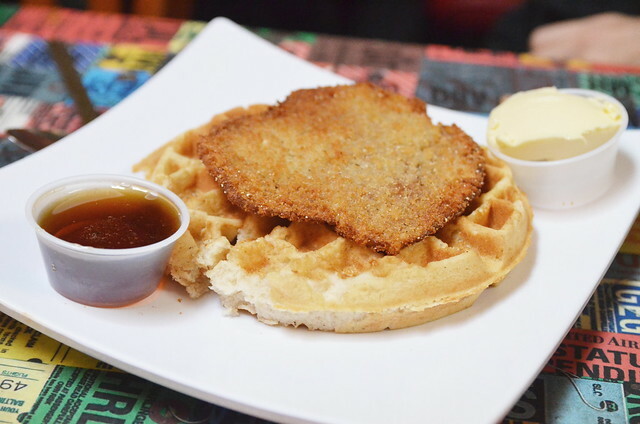 But the leathery sheet of battered and fried seitan atop a crisp waffle is better avoided. 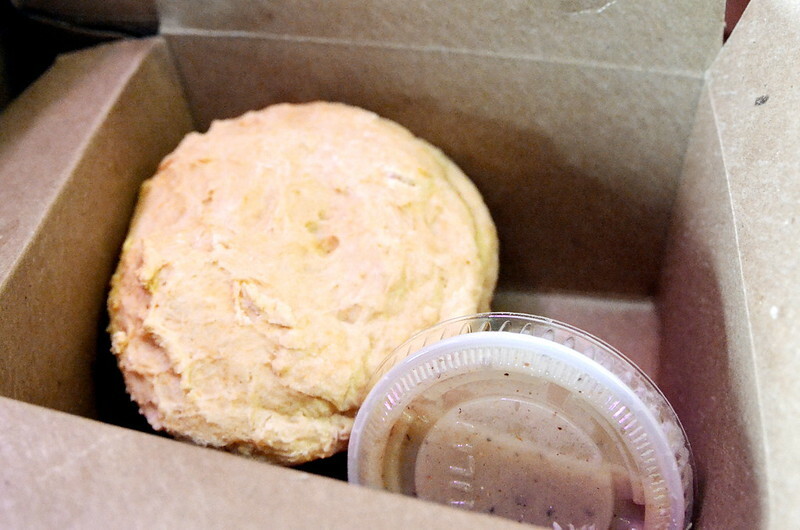 A few days later we met up with friends at Beer Revolution so you know what that means… take out from Souley! The BBQ Tofu seems the next appropriate protein to try. It’s a saucy winner. 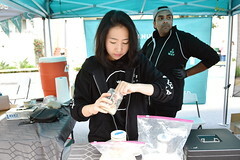 Tamearra Dyson is a master of tofu! On the side I revisited the Collard/Mustard Greens because it’s kind of the greatest. I also ordered a classic Biscuit and Gravy. It is fine… like just okay… but why anyone would choose this over the luscious cornbread is a mystery to me. There are some good (great!) 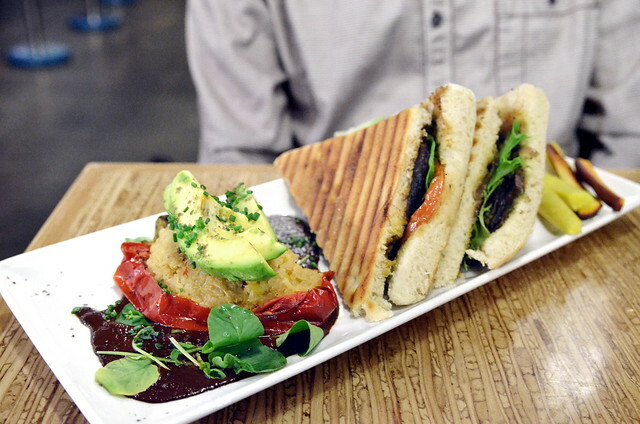 vegan items that have just hit the menu Torrey Pints! 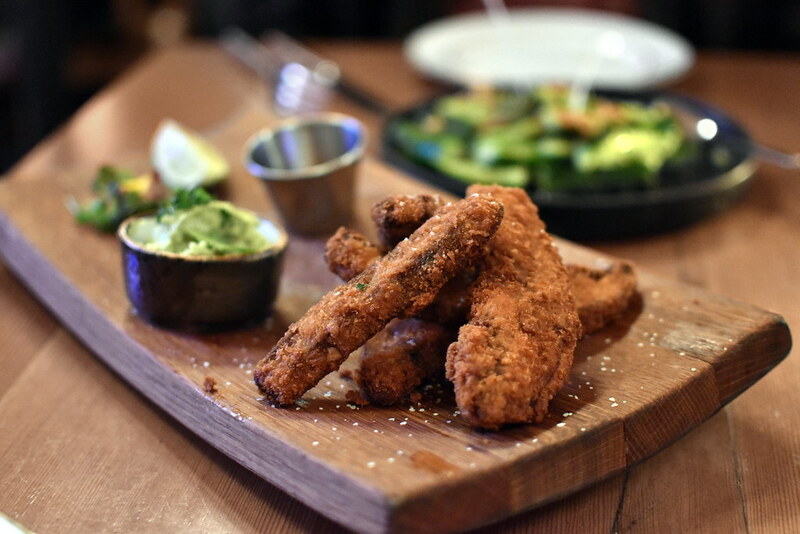 Chef Vanessa Briscoe created a slew of new vegan options for the pub menu. 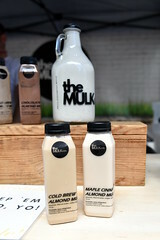 I got a sneak preview of the in progress items and am THRILLED with the new offerings. While the quantity of items doesn’t compare to some other Whole Foods pub menus, the quality is superb. 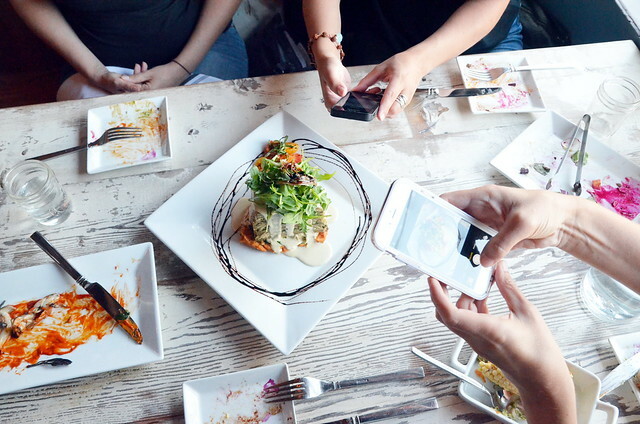 The largely whole-food and plant-based dishes explore the chef’s creative edge… to our benefit! The Raw Vegan Paleo Wrap is filled with veggies, black beans and quiona then given a hint of complex sweetness from shredded coconut and fresh pineapple. Finished with black salt… I predict I’ll be eating a lot of these in the future. Eggplant Marianna maybe coming soon to Torrey Pints Tapas night! 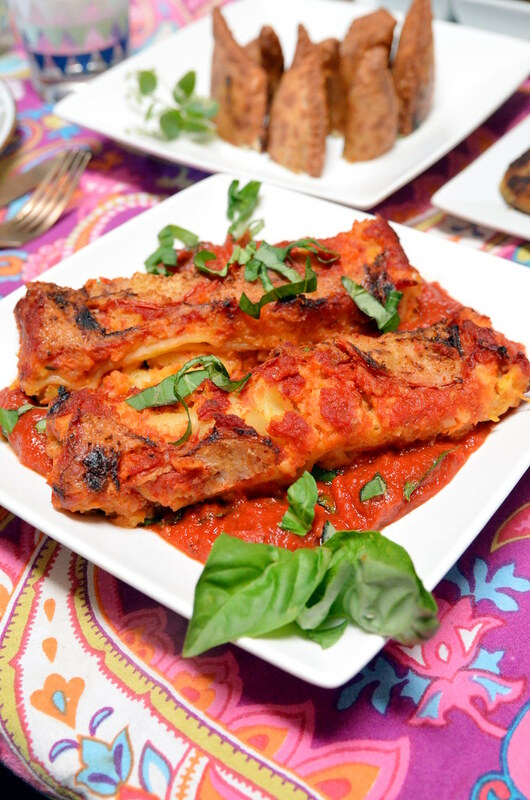 Crinkly skin of a Thai eggplant curl up exposing tender seed-filled flesh in a pool of pulpy tomato sauce and basil oil. When first saw the Heirloom Tomato sandwich I though: Um, it’s just a slice of tomato on bread… But this is a fine example of produce quality shining! 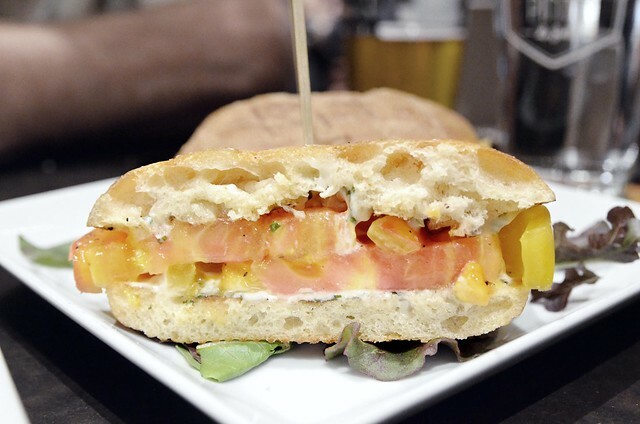 Juicy fat slices of tomato are slathered in a mint basil mayo and stuffed inside a ciabatta bun. It’s my favorite of the new items. 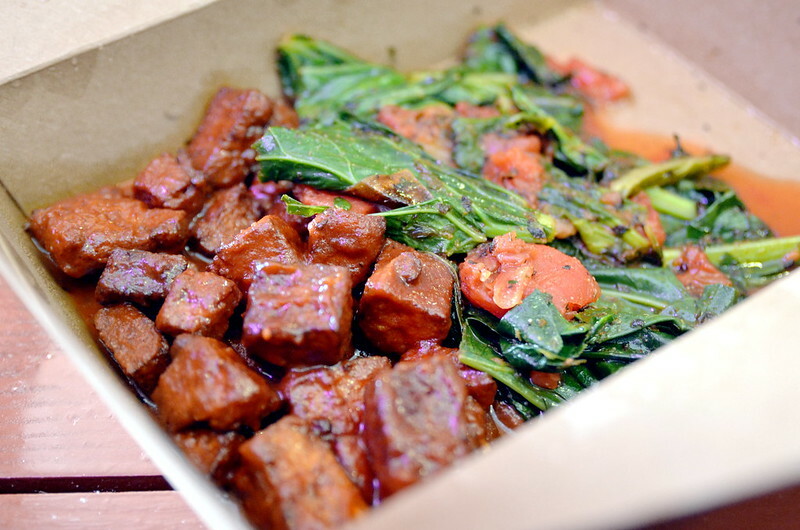 Spicy SD Soy Dairy Tofu Bites… this are good if for some reason you’re not in the mood for the Buffalo Cauliflower—which, don’t worry, is still on the new menu. And lastly, the Beyond Meat Beast Burger has come to Torrey Pints! 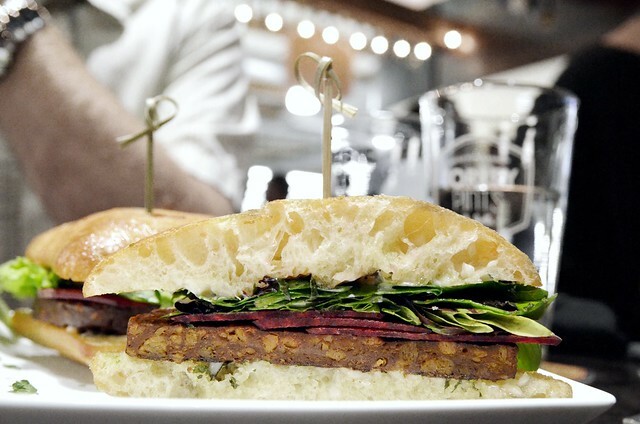 Layered with shaved beets and greens on a Bread & Cie ciabatta bun slathered in herbed mayo it’s a beautiful change up from the previous taro burger.